Ask people to name just one of King Henry VIII’s six wives and the chances are they will name Anne Boleyn. Love her or hate her, she led an amazing, though brief, life and her untimely death still courts interest and debate 475 years later. Although she died still a young woman and was Queen of England for just three years, she left behind a legacy which is still strong today. Aside from the circumstances surrounding her final days, Anne is also remembered for being influential in the birth of Anglicanism and breaking England away from the Catholic Church. The Pope, Clement VII, would not support the assertion that Henry’s marriage to Catherine of Aragon was invalid and so, after 7 long years, Henry broke with Rome and declared himself head of the church in England. The Archbishop of Canterbury, William Warham, opposed Henry’s desire to put Catherine aside and when he died in 1532, he was replaced with Thomas Cranmer, a Boleyn supporter, who announced the Aragon marriage null and void, and that with Anne, lawful. So began the Anglican Church. Anne was also hailed as a saviour to those persecuted abroad for actions including the smuggling of banned books from Europe. Moreover, Anne actually owned copies of some of these books and openly displayed them in her chambers. The Bible was only permitted to be published in Latin (it was believed only learned people should have ‘direct access to God’) but now, it could be read in English and opened up interpretation of the Scriptures to all. Changing to a predominantly English service undoubtedly enabled the clerics to engage further with their parishioners, thus deepening their faith. Her influence with the new religion continued during Elizabeth’s reign with her veneration as a martyr of Protestantism by John Bridges in 1573. Despite a brief return to Catholicism under Mary, the new faith was taken forward and upheld by King Edward VI, Queen Jane (Grey), and Anne’s own daughter, Queen Elizabeth I, and has remained as England’s principal religion to this day. Anne made a personal impact on many of those surrounding her, in particular her step-daughter, Mary. It is known that Mary blamed Anne for numerous things including the enforced separation from her beloved mother, Catherine of Aragon; the break with Rome which saw her faith tested to the limit; and her status demoted from that of Princess to simply ‘The Lady Mary’ with her place in the succession superseded by Elizabeth. Mary blamed Anne alone for all that had befallen her and this had a deep impact on her adult life. She grew from a bright and happy child to a bitter and resentful woman who suffered frequent maladies and was prone to fits of hysterics. Indeed, when she became queen, her primary and overriding obsession was to return England to Papal rule. She oversaw this reversion with a passion and zeal which led to hundreds of her subjects suffering the agony of being burnt at the stake, and resulted in history labelling her ‘Bloody Mary’. One of those burnt was the Protestant Archbishop of Canterbury, Thomas Cranmer. Cranmer had been a supporter of Queen Anne and it was he who had pronounced Mary’s parents’ marriage invalid. In 1558 when it was apparent she was dying, she felt immense bitterness towards Elizabeth, who was the only real candidate as heir, the daughter of the woman she blamed for making most of her life an utter misery. Although she accepted Elizabeth’s claim as heir (despite frequently declaring her to be of base birth), she still could not bring herself to say her name when pressed to nominate her successor. Anne’s main legacy is named Elizabeth. On 7 September 1533 Anne went into labour to give birth to Henry’s long awaited son. The heir to the crown he had moved heaven and earth for was born just after 3pm – but it was a girl. A daughter was of no use to Henry and could only be expected to make an advantageous foreign marriage to strengthen an alliance between England and probably either France or Spain. This ‘useless’ little girl grew to become one of the greatest monarchs England has ever known. Reigning for over 44 years, she earned the name ‘Gloriana’, defended her throne from those who believed they had a stronger claim, and saved England from foreign invasion. Though Elizabeth never spoke of her mother, Anne’s influence was evident both in her daughter’s personal life and throughout her reign. Elizabeth never married and despite numerous requests by her council to do so, she remained single. Consequently, she left no heir to her throne and the crown passed to her next of kin, King James of Scotland, finally uniting the two countries. Her strength, courage and determination, often in the face of adversity, are character traits inherited from her mother. When Elizabeth died on 24 March 1603, the locket ring she had worn on her finger since around 1575 was opened and found to contain enamel miniatures of herself and her mother, proving that although she was never mentioned, Anne had a profound effect on her daughter and her memory was never forgotten. As her life left an indelible mark on history, so too did her death and the days leading up to it. Anne had many admirers, but she also made many enemies. England’s move towards Anglicanism wasn’t popular amongst the staunch Catholics and those loyal to Catherine of Aragon and Mary. Opinion is still mixed regarding her innocence of the charges laid against her, but whatever that viewpoint is, the courage she displayed throughout her trial, imprisonment and final hours was admired by even her harshest critics. The Imperial Ambassador, Eustace Chapuys, who abhorred Anne and welcomed the news of her execution, commented in one of his dispatches that she was ‘condemned on presumption, and not evidence, without any witnesses or valid confession’. Because of her naturally flirtatious nature it was easy for her detractors to convince the king of her ‘guilt’. After her death, rumours spread about her including the one that claims she had six fingers on one hand. One particular detractor was Nicholas Sander whose work “Origins and Progress of the English Schism” was published during the reign of Elizabeth. Sadly, many of these rumours are still believed today and relayed as fact, only serving to taint her reputation nearly five decades later. Even Anne’s critics cannot deny she led a memorable life and that her death still holds fascination, morbid or otherwise, today. The Tower of London receives an average of over two million visitors every year who are keen to hear her story and to see her final resting place in the chapel of St Peter ad Vincula. She is arguably the figure most associated with the site. It surely cannot be denied Anne Boleyn had a profound impact on history. She was instrumental in the birth of Anglicanism, a religion upheld by the incumbent queen, was generous with the poorer of the realm, saved some who suffered under religious persecution in Europe and gave birth to a great monarch whose reign bears all the hallmarks of her mother’s personality and strength. Her wrongful death and the circumstances leading up to that day are still debated with the general consensus being that she was wholly innocent. A conclusion which, far from courting the sympathy he expected, reflects badly on Henry himself and helped to cement his enduring reputation as a cruel, vindictive tyrant. 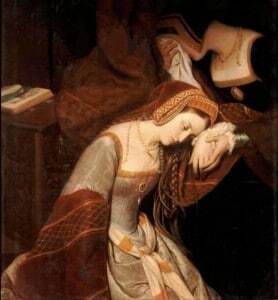 Her life and death are still the subject of books (fictional and biographical), tv shows, films, stage plays and websites dedicated to her memory, most notably, The Anne Boleyn Files. When Anne spoke from the scaffold on that fateful day : ‘And if any person will meddle with my cause’, she could never have imagined the millions of people that have done just that, as we do from day to day on this site. I always have felt sorry for Mary. Some part of her must have known that daddy dearest was the real power behind the throne and he was the one who made her life so difficult. I doubt that Edward’s move toward more reforms helped Mary become more tolerant. Probably the worst time for her to be crowned queen was right after a period of more reform. I think she just did not want to believe that everyone would be as keen as she was on a return to the Roman Catholic faith. Cardinal Pole and the King of Spain did not help matters and the revolt led by Thomas Wyatt certainly was not a good move. I wonder if Elizabeth could have learned from this and realized that marrying a foreigner would mean too much access to English political affairs but that marrying an Englishmen would cause the others to become jealous of that person’s power over the throne. I can understand why she chose neither path and found another way to keep a more stable political base. Her intelligence and charm are certainly some things she inherited from her mother.